Iceland Photography Experiences – Where to go + What to Photograph in Iceland. Iceland and photography are like peanut butter and toast, they go together. It’s where glaciers, waterfalls and other-worldly landscapes await you and your camera, ready to provide the adventure of a lifetime. I’ve previously written a guide to Iceland’s South Coast photography locations and also the Snæfellsnes Peninsula but this time it’s a little different. I wanted to put together a list of the best photography experiences you can have in Iceland. From reflection hunting to photographing the northern lights and underwater photography in two degree water. Take a peek at my top 10 photography experiences below and if you like them, or have your own recommendations, feel free to leave a comment at the bottom! If you’ve got a wide-angle lens in your kit this is the perfect place to use it. Few things compare to standing beneath an iced ceiling that’s centuries old, crackling and dripping, an ever-changing natural phenomenon. 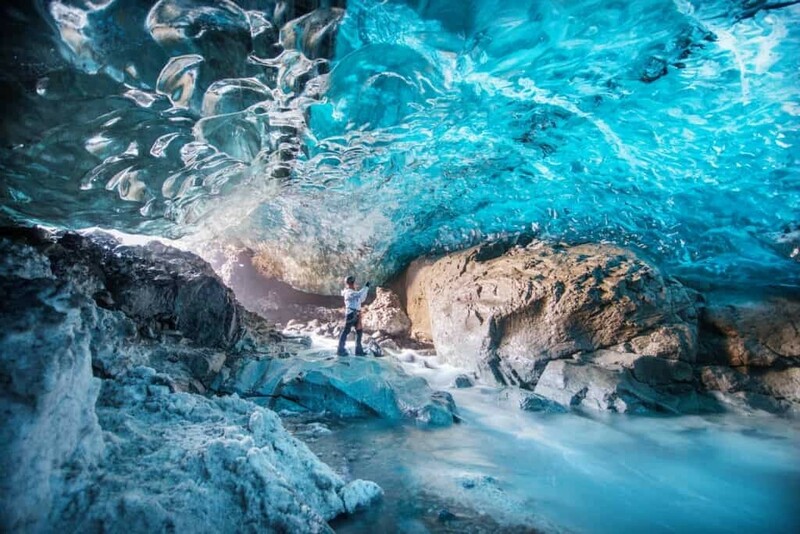 You’ll witness every shade of blue as it cascades up a wall of frozen bubbles deep inside Vatnajökull Glacier, Europe’s largest glacier mass. Photographing inside an Ice Cave is like stepping into another world. Be prepared to use a tripod in order to capture the intense brightness/darkness experienced by the funnel of light. You may also need to capture longer exposures if you’re in a cave with a group of people to blur them out with movement. If you’ve got a wide-angle lens in your kit this is the perfect place to use it. The caves vary in formation each year but have a peek at my photos from a previous trip as examples. They were taken with a 7-14mm Olympus f/2.8 (14-24mm equivalent) which helps to add perspective and show just how huge they can be inside. Mist bellows out like a smoke machine, with it floats rainbows and seabirds, soaring above the roaring falls. Skógafoss is mighty, majestic and my favourite waterfall in Iceland. Is that enough waterfally words for you? Its symmetric structure aligns itself perfectly to landscape photography with the surrounding creek and fields allowing for endless angles. Arrive before sunrise (spend the night close to Skogafoss here) to ensure you can experience this place in it’s full glowing glory. Once the tour buses arrive from Reykjavik it can get a little hectic here so it’s one place where the early bird really gets the shots! That or sunset and on into the night, especially in summer when the midnight sun illuminates Skógafoss all night long. Its symmetric structure aligns itself perfectly to landscape photography with the surrounding creek and fields allowing for endless angles. 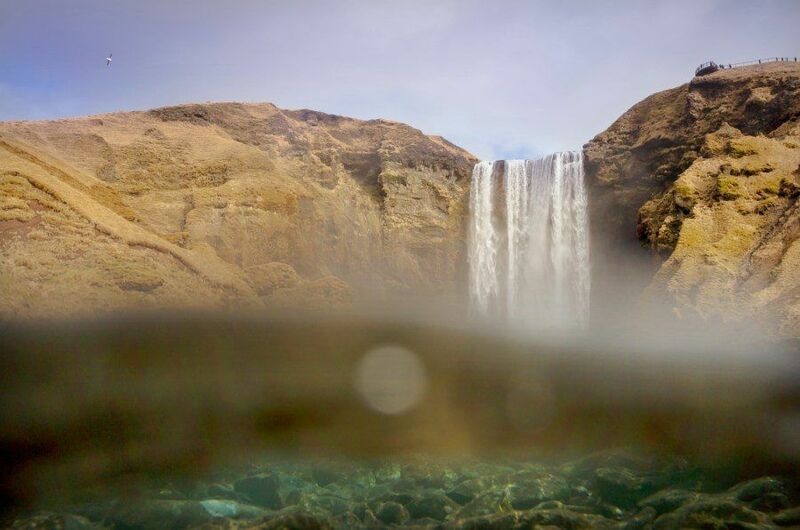 Skógafoss falls over what used to be the coastline of Iceland, now it’s home to one of the most visited natural wonders in the country. For photographers you’ll see tripod scattered all over but one spot that tests everyone is right beneath the falls. The mist is so intense that you can’t expect to be anything but drenched, it’s a challenge though that you need to experience in Iceland, even if you leave your camera in the car. If you’ve got an underwater housing this is a great place to get it out, otherwise, wrap your camera in a raincoat and see what you can create. Make sure your camera is at least weatherproof though, it’ll get quite wet! A little Olympus TG-5 would be perfect! Here seals splash between icebergs that have separated from the Breiðamerkurjökull Glacier on their journey out to sea. This lagoon is so photogenic it’s almost hard to describe with words. 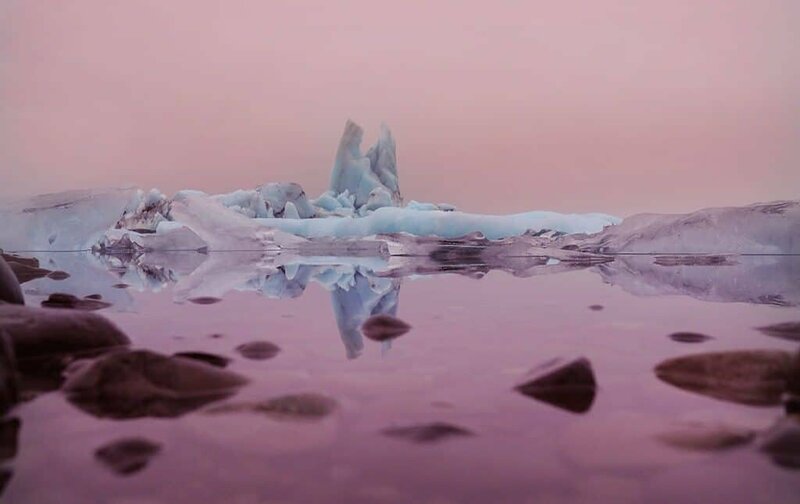 From your first glimpse Jökulsárlón will wow you, then the more you stare the more you’ll discover its incredible layers. At sunrise you can wander the crowd free shores and photograph reflecting icebergs provided the chilly winds aren’t too strong. 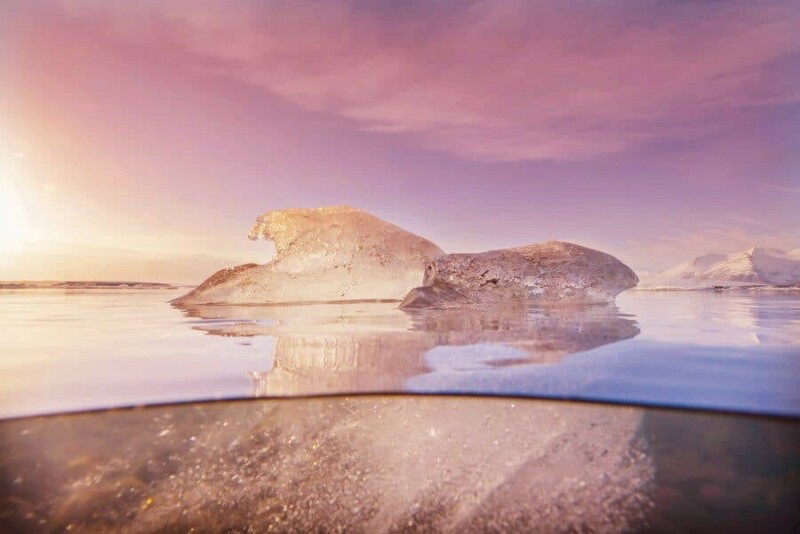 The water clarity in the lagoon is ideal for split-level photographs also, if you’ve got an underwater housing or waterproof action camera then don’t be afraid to wander up to your knees and photograph some of the closer icebergs. Obviously the water is freezing so pack some gumboots and thermal socks to keep your toes toasty warm. If you’re visiting during Aurora season (Sept-March) Jökulsárlón is a great place to wait for the dancing lights to appear. It’s far from any form of light pollution and while you wait you can listen to the icebergs crackling and seals chatting. 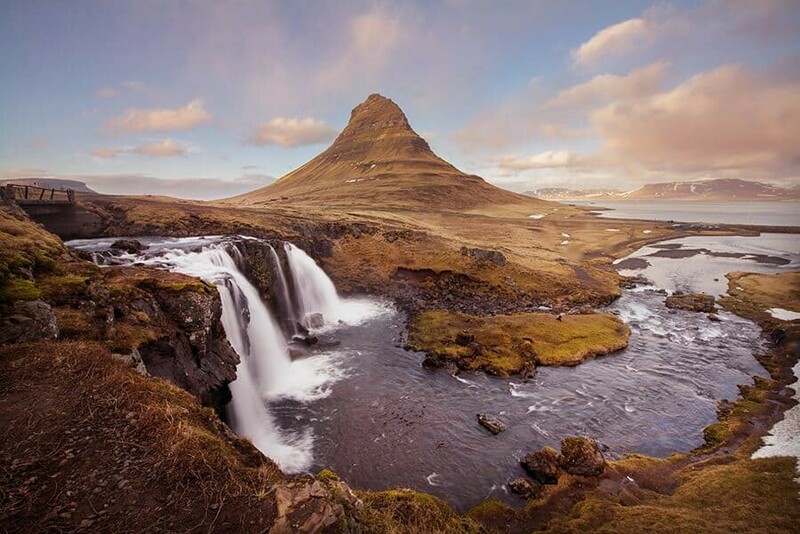 Sitting pretty on the coast of Snæfellsnes Peninsula, Kirkjufell is one of the most photographed mountains in Iceland. It’s pointed, witches hat-like shape means it’s a landscape that’s possible to photograph from numerous angles. You can capture this beauty from across the fjord at Grundafjordur, from the western side or from everyone’s favourite spot, Kirkjufellsfoss. Located on the southern side of the road beneath Kirkjufell, this waterfall is perfectly located to compose the mountain in a series of landscape images. In winter you may find it’s frozen with giant icy stalactites and a carpet of snowy goodness. Other times though it’s flowing strong, offering a great opportunity to take long exposures. This spot is also a popular location for aurora photos with Kirkjufell providing the perfect subject as the northern lights dance around it’s peak. The coastline of Iceland is dramatic and stunning no matter where you are but Stokknes is wow inducing and almost overwhelmingly beautiful. Jagged peaks rise from the crashing waves which contrast against the black sand beach. Sand dunes with tufts of wispy grass cover the southern corner like a decorated pathway that leads you onto the beach. Stokknes is actually located on private property so before accessing, you’ll need to stop at the Viking Café and pay an entrance fee to the owner. Once done though you can drive in and stay as long as you like. My tip is to take a few moments to soak it all in. Look around and give yourself time to let the beauty of this place really inspire your photographs. Even better, book yourself a few nights to use Hofn as a base for exploring this stunning, crowd-free coast more than once. There are so many perspectives to photograph here, wide-angle landscapes of the entire scene; reflections of the Vestrahorn in a tidal pool; people walking over the dunes with the mountain range looming behind…it really is such a photogenic landscape here! If you’re an underwater photography addict like me, this place will take your breath away. Snorkelling or diving in a deep ravine between continents, sounds kinda cool huh!? 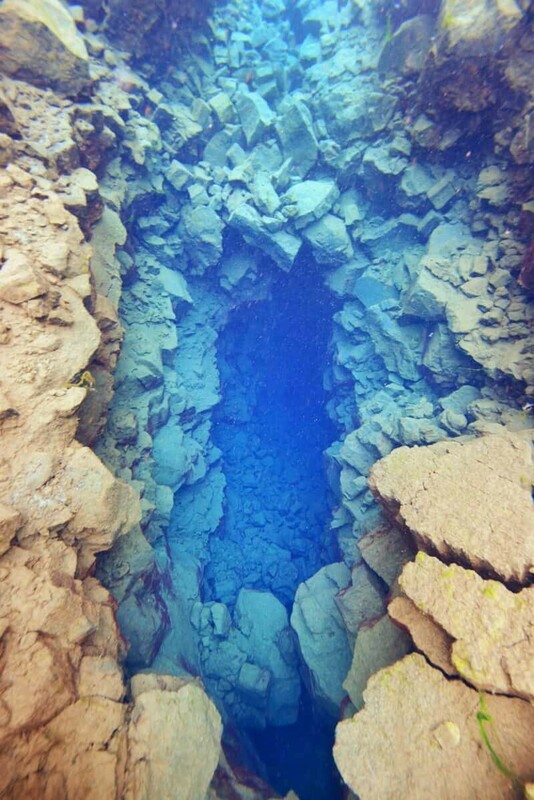 Silfra is located just a 45minute drive from Reykjavik and it’s in this national park that you’ll find a deep, clear water crack in the earth, one that descends about 100m down. The aquatic wonderland is blended with shades of aqua and deep, dark blue and you’ll never have to worry about clarity because visibility here is astounding. From the moment you jump in (in your dry suit), the freezing cold water will hit your face and smack you with excitement. The shock of 2degree water will soon disappear once you pop your head underwater and gaze at the incredible scene below. There’s a gentle current that pushes you down stream so be sure to have your camera set on a fast shutter speed to avoid any blur caused by the constant movement. I shot with my Olympus Underwater Housing PT-EP14 + OM-D E-M1 MkII and had the 7-14mm wide-angle lens inside which is my favourite for underwater images, take a peek at the ‘What’s In My Bag‘ page for more info on my gear. 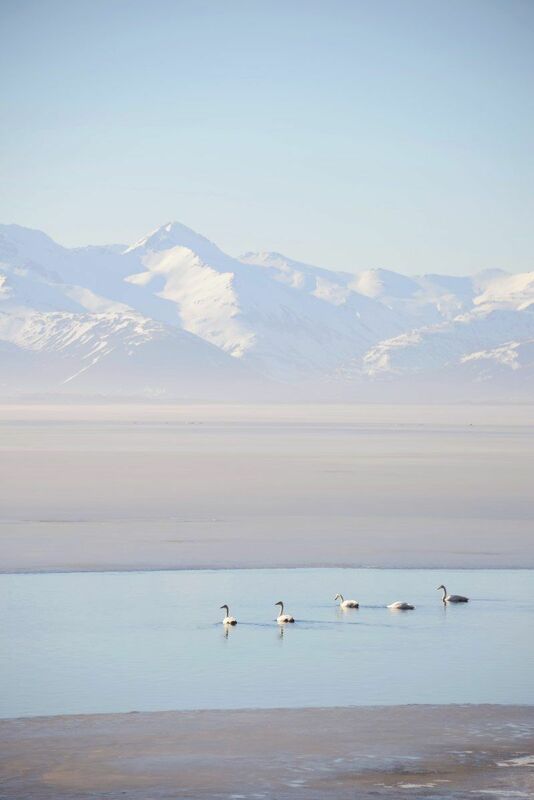 Nesting swans in their hundreds gather in the shallow waters of the Lon Valley, just one of the beautiful locations found along the drive from Hofn to Djúpivogur. Be ready to slam the brakes as you take this drive because there’s so much to see. From reindeers to surf breaks, roaring rapids and dramatic cliffs. You won’t pass any towns, only small huts and farm houses but there are a number of small tracks or parking spaces beside the road for you to pull over and capture the scenery. 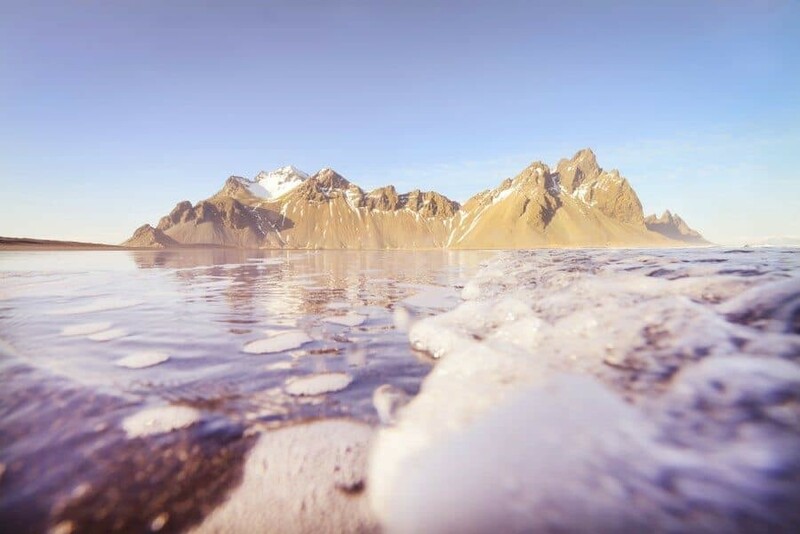 A great place to stop is 64°25’26.7″N 14°36’50.7″W which is a little space along the shore about 4km before Hvalnes Lighthouse to park your car and wander the shoreline capturing landscapes of Vestrahorn and the mountain range hovering just overhead. Depending on what time of year you visit, the shoreline and bay could be covered in a sheet of ice, or have flat icebergs lining the beach, or simply be sparkling under the midnight sun. The northern lights are magic. It’s as simple as that. 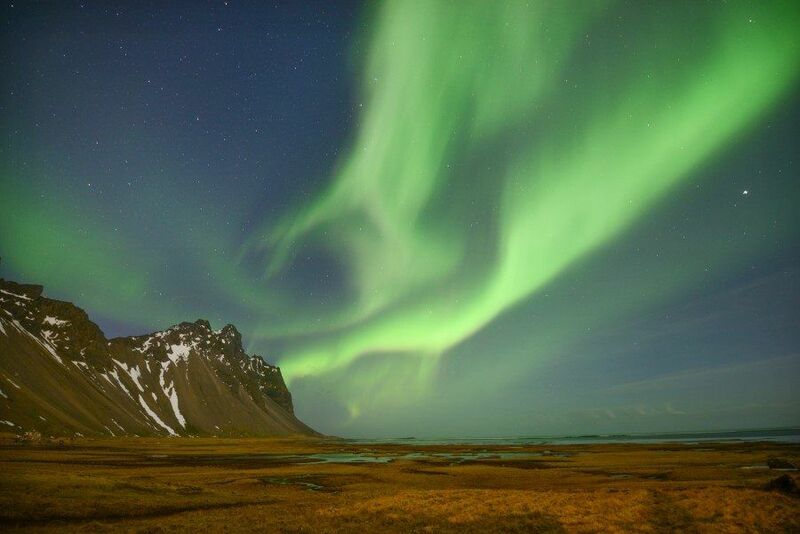 Seeing the green waves of aurora dance above Icelandic landscapes is one of those once in a lifetime experiences and for a lucky few, you might get multiple viewings during your trip. If the skies are clear and dark your chances of seeing aurora is pretty high! They’re unpredictable though which is what makes them so darn alluring, the wait only adds to the impact and feeling once they appear. Great spots to view aurora are of course away from Reykjavik and towns. Find a spot that’s low in light pollution like Jokulsarlon Glacier Lagoon or Stokksnes and wait it out with your fingers and toes crossed. To photograph aurora you’ll need a tripod to keep your camera steady and it can also help to set yourself up with some aurora apps that can predict when they’ll appear and how strong. If you’re into waves and water, this part of Iceland will fulfill all your coastal wishes. Here the North Atlantic Ocean meets steep cliffs and Icelandic myths forming a landscape that you can stare at for hours. Starting up at Dyrhólaey Lighthouse you can photograph views over the super straight beach heading west and Dyrhólaey arch which translates to ‘door-hole’. 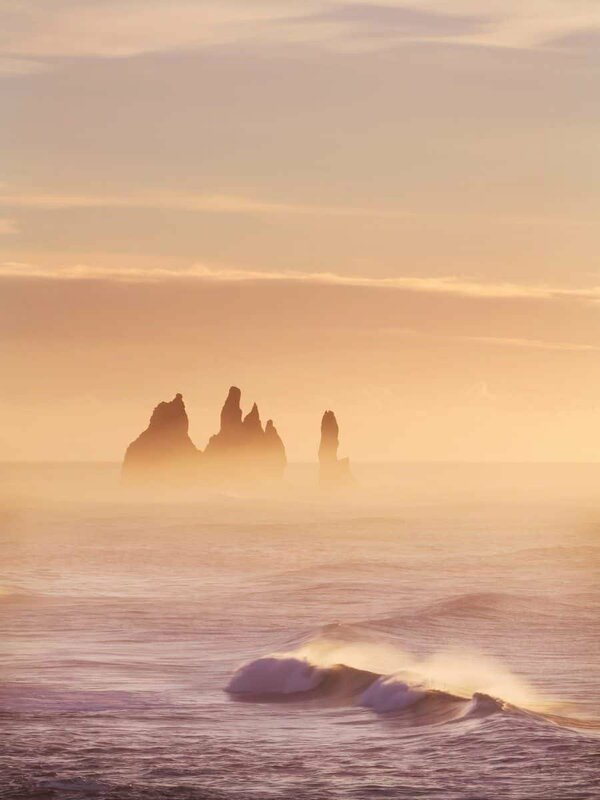 For a great sunrise vantage point park at Kirkjufjara Beach and shoot the waves rolling in along Reynisfjara Beach which stems off to the east. 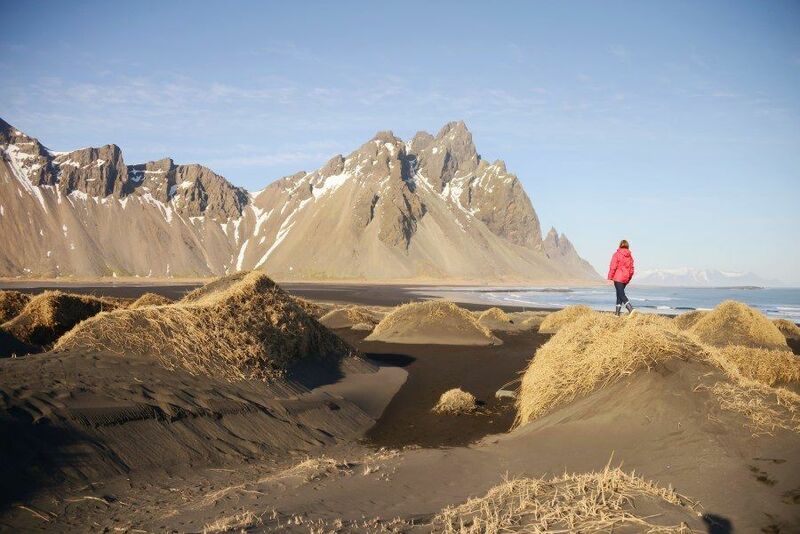 A short drive around the bay to Reynisfjara Beach will have you arriving at the photogenic (and popular) black sand beach where basalt stacks form a dramatic seascape. Iceland is well, icy. About 11% of the country is covered in glaciers with around 270 noted on record, that’s a lot to explore! Some of the most accessible are found along the south coast where you can hike them, get inside them and photograph them from afar. There’s Sólheimajökull which is popular for glacier walks and day trips from Reykjavik or once you get further along the coast you can actually drive right up to some. Svinafellsjokull is accessible by a little rocky road and you can walk right up to the edge and overlook its frozen fingers that stretch over the volcanic soil. 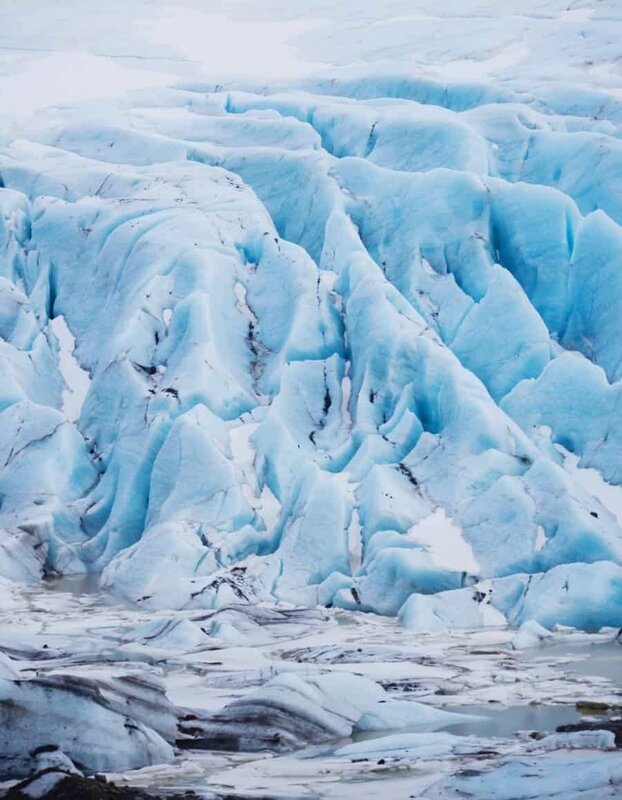 When photographing glaciers keep an eye out for the patterns and details found within the landscape. They’ve been forming and reforming over thousands of years so there’s layers of aged ice, each with a slightly different colour tone and sometimes texture. 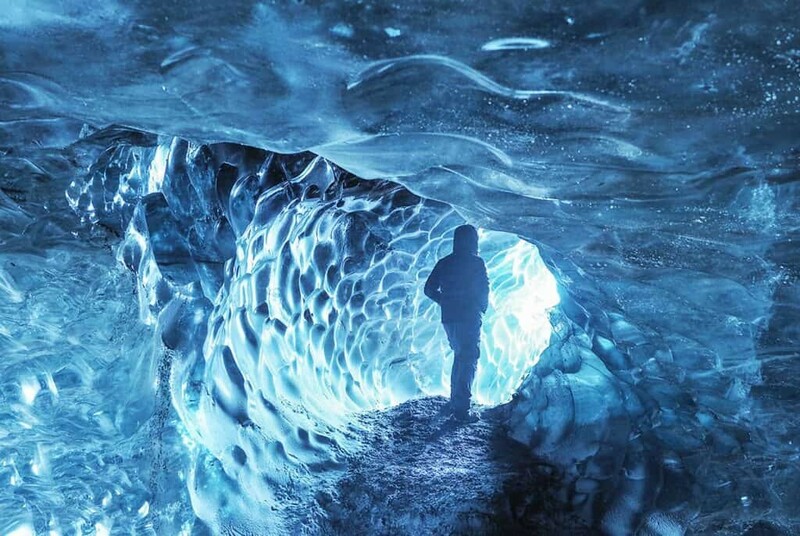 Vatnajokull is Iceland’s biggest glacier which is where you’ll find some incredible ice caves, which takes us back to experience number one…ice caving, which in my opinion is one of the best photography experiences you can have in this photogenic country! 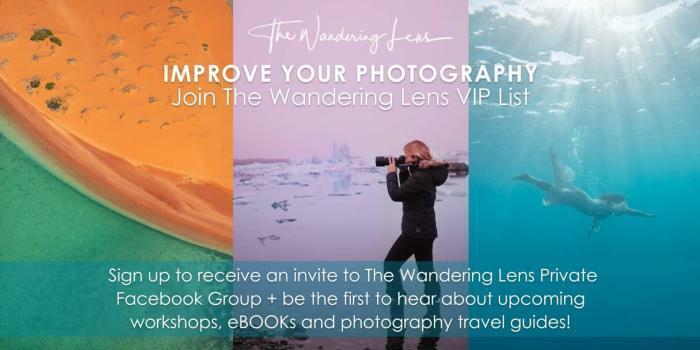 Have you been to Iceland and have something to share about a great location or photogenic experience? I’d love to you share your experience in the comments below! This is SO a bucket list post! I love the different levels you shoot from. These photos are magical and makes me want to see Iceland even more! It’s top of my list! Beautiful post! 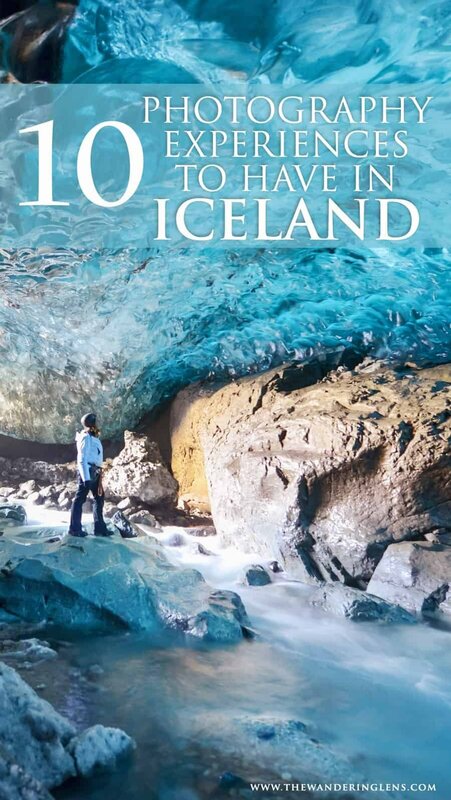 You have some great photography and Iceland looks like an absolute paradise for photographers! I would love to add this destination to my bucket list and take some beautiful shots! Wow! So, so beautiful, and such incredible experience to capture! I will definitely be going there one day and hope I can get some great shots like yours too! So I already wanted to go to Iceland, but now I really want to go. What a diverse and beautiful place. I would love so much to photograph between the continents. Actually, I’d love to photograph all of these, but I can start there. Just wow! Great shots, beautiful place, who wouldn’t want to see these for real. Such an amazing blog, it really proves Iceland has so much to offer.